Include anti-oxidant food in your diet. Eat a salad for morning breakfast and also in dinner. 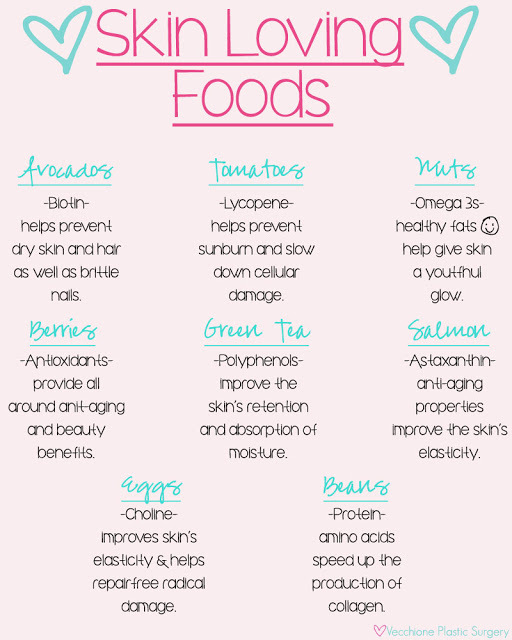 Vitamin E keeps your skin younger and beautiful. Everyone wants shiny hairs, glowing skin, beautiful eyes, but only makeup doesn’t make you look good, you must be beautiful from inside, but this happens only when you have a balanced diet. Here are some tips for glowing skin to look fair for men and women. Gently add cereal food in your diet like fresh fruits, green leafy vegetables, meat, fish etc. To remove wrinkles from face antioxidant diet is necessary, it protects from free radicals. Also take blackberry, strawberry, artichoke. To get rid of black dots on the face, water is the best solution, it helps to remove unwanted materials from the body. you can also take herbal tea, soup, fruits and vegetables that contain 10% of water, it gives glow on skin, you need to drink around one and a half liter water in a day. Protein also helpful for skin, so include protein in your diet, you can add white meat, fish, eggs, milk, curd, cottage cheese. you will get protein in sufficient amount to your body. Lemon, sweet lemon, green chilly are fulfilled with vitamin C. You also include this in your diet because vitamin C. is very necessary, it helps to keep your skin maintain. Eat seedy fruits like watermelon, litchi, orange. seasonal fruits give a lot of nutrition, it helps skin from destroying, it not only maintains your skin but also keeps your body healthy. To get shiny skin add salad in your body daily diet, in that carrot, radish, vitamin C, vitamin E must there, it provides moisture to your dry skin, it present in seafood, flax seed, labia. salmon fish contains omega-3-fats, which provides moisture to your skin. To make herbal skin cleanser of basil, milk, and curry you will need 6-7 basil leaves, one clean bowl, half cup of milk. Here is how you can prepare your cleanser at home. Take 6-7 basil leaves and curry leaves, wash them thoroughly with water, after that now place them in a clean bowl. take half cup of milk in a pan and bring it to a boil. let the milk cool for some time, after that add all the leaves to the milk and let it settle for a half hour. Now, strain the mixture and your homemade cleaner is ready to use. Apply the cleanser all over your face and neck and gently massage for 4-5 min. Then, gently wipe your face with a damp cotton or cloth. that’s it your skin now fully clean.